The French flair and the desire to discover the world have helped our athletes to easily export their talents abroad. I started playing football very early at the age of 6 in a club team in Trun, a small town in Normandy. I always had a football between my feet, I went all the time with my father near the fields. He was a good football player at the regional level. I was a calm and very academic child. Since I was little, I try to do what I am shown, and what I am told. I wasn’t trying to invent things. When you are young, you dream of being pro. But for me it was never an obsession. I was playing in a small regional club and becoming a pro seemed inaccessible. Moreover, at the age of 13 I went to a football academy and was with players much better than me, so I never deluded myself. I finally reached the fourth national division with the USON Mondeville team. I was proud to play at this level. Initially my ambition was just to become a sports teacher, so to be 20 years old, play a full season in this league, finish 7th, as well as making into the final of the National University Championship with the University of Caen, I had already achieved my goals in football. I was eventually spotted by SM Caen and signed to go pro in 2001, so I made my debut in the 2nd division that summer. In 2004 we joined the 1st division, we were relegated to the 2nd division at the end of the season. Regardless, I continued the adventure with SM Caen. Two years later we got back to the 1st division and we finish beautifully in 11th place, ensuring this time we would remain in the 2nd division. Then in the summer of 2008, I transferred to the AJ Auxerre thinking I had experienced it all, in the sense that I had participated in two promotions, a relegation and a final of the league cup. So, I thought I needed a new challenge. At the end of the 2011 season, while still with AJ Auxerre, I played in the Champion’s League. Thinking I had reached the peak of my career, I asked my agent to search for other possible prospects. However, in early June AJ Auxerre made me an offer. I had 15 days to reflect and make a decision. Since I had not received a written proposal from the other clubs, only “hearsay”, I chose to play it safe and sign with AJ Auxerre for two more years. Thankfully, the decision was a bit easier as I loved the AJA club, so it felt as though everything was brought together for me to stay. Unfortunately, one year later we went down to League 2. I had some bites for a League 1 contract, but due to the amount of transfer fees it did not happen. Then, a change of presidency at the end of the year allowed me to cancel my contract so I could sign with Ajaccio in 2013. In 2014 I had been with Ajaccio for a year. We had just come off a difficult losing season, I had a few issues with Coach Ravanelli, and the club wanted to reduce the payroll. At this moment an agent who knew the Ajaccio leaders had proposed the possibility of a contract in India, in Indian Super League. 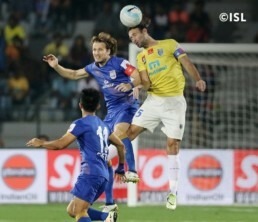 Since its creation in 2014, the Indian Super League has relied on big names in football like Robert Pires, David Trezeguet or Alessandro Del Piero. Other renowned players will arrive the following years, like Florent Malouda and Diego Forlan. It was a little unclear because there wasn’t anything yet, just the name of the teams. The only foreign player known at this time was Robert Pires, World Champion in 1998. The championship did not yet exist, it was being created. I discussed this at length with the leaders of Ajaccio, as for me it was the first time that I had received a written proposal from abroad. It was not in the top European championship but still good. Plus, after 2 difficult years with Auxerre and Ajaccio I did not expect to have a great offer. So, when this championship was being created I thought of it as a great opportunity not only for me currently, but also for the future. So, I said yes to the Kerala Blasters and by the end of September I was on the plane! The arrival was a bit of a challenge, I had arrived at the airport with my new French teammate Raphael Romey at 4 am and there was nobody to welcome us. It was very early in the morning and we did not really know what to do. We took a taxi to the hotel where the team was supposed to be staying, however they had gone 100km for an excursion. Everything worked out later eventually and we met the team. I was nervous about the whole experience as Raphael and I had already run into trouble obtaining the visas. We arrived 10 days after the rest of the team. All the friendship circles had already formed, especially among the foreigners as they were primarily English and didn’t pay us much attention. Supposedly, we were not well known. That perception changed quickly at the first practice. I found the level to be quite low and it was easy for me. I remember the Indians who had come to see my French colleague say “but Cedric is very good” and as a good friend he continued to talk me up by telling them “what you do not know is that out of all the foreign players, Cedric has the biggest CV and is the best player here; he played the in Champions League and played against Ronaldo.” Their perspective on me changed, as well as the other strangers, as they all came to realize I was not an inexperienced player. My coach was David James (formerly International English – 53 selections) it was weird as he was a coach and goalkeeper. Initially, I think his look on me was identical to those of my teammates. I think he did not count on me, but after a few trainings he realized that he was going to have to deal with me and put me on the field as a starter. A typical day was very simple. After a morning of practice, we would return to the hotel around noon for lunch. We spent the afternoon in our rooms (fortunately Internet was available to watch movies), then had some massages and treatments around 6pm, before finishing with dinner. We played every three or four days with very long trips that could last up to 12 hours. The level of football in India is progressing slowly. At the beginning there were big stars and Indian players with fairly weak qualities and then now we have lesser known foreigners so it is a little less technically strong but there is a good level with Indians who have progressed enormously. It is therefore more homogeneous. In order to gain notoriety, the national team must participate in a World Cup. The spectators’ affluence depends on the stadiums according to the regions. Some areas are focused on football and playing in front of 50,000 people is common. For other places, cricket is the dominate sport, such as in Delhi or Mumbai, which are their big cities. In these areas, it was more common to have about 15,000 spectators in a stadium of 45,000. People are beginning to have an interest in football and it is becoming a major sport. The thing is Cricket is in their genes, but I think that in 3 to 5 years, football will have taken a big increase. The main lesson I learned from this experience is humility, especially regarding the poverty there. It’s common for us to complain, especially young people, even with everything we have in Europe. But when I see life for some people in Asia, it makes me realize how well off we really are. And what’s nice is that despite the differences in the payroll, people are not jealous, instead they are proud to have great players on their team. In January 2017, I signed to Malta at Mosta FC. The first reason was I wanted to play from January to May to keep in shape to be able to go back to India afterwards. Secondly, the challenge of saving the team from relegation was interesting, which we did. The financial opportunity was pretty weak, so this choice was solely for the pleasure of football. For some teams, the level of the Maltese Championship is the equivalent of the 3rd division in France. For others it’s lower. The problem is that it’s a small island and it’s hard to get a championship going. It’s like putting a national championship in Corsica. With so few people, it’s hard to create a competitive championship. The crowds are not very large, generally only 300 to 400 people. And they are made up of people from the club and the player’s families who come out to show support. Everyone on the island knows about Maltese football, but almost none follow it. They prefer to go to pubs and watch English games. I am very proud of my experiences, in Malta and everywhere else. I made a lot of friends and it gave me an open mind. If I had to do it again, I would do it all over. Concerning the future, I have quite a few options. Currently, I work in a gym and am on my way to obtaining a few degrees, so I can coach people. I would also like to be a TV football pundit. I already do it on France Bleu Auxerre when Auxerre plays at home.